Logitech HID-compliant Unifying keyboard 106 keys is a Keyboard hardware device. The Windows version of this driver was developed by Logicool. The hardware id of this driver is HID/VID_046D&Class_00000006&Col01. 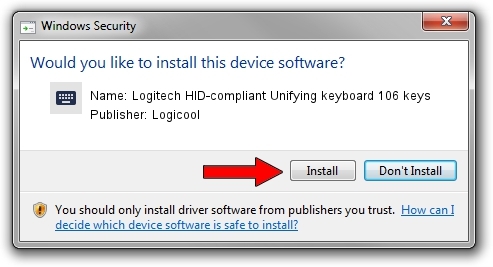 You can download from the link below the driver installer file for the Logicool Logitech HID-compliant Unifying keyboard 106 keys driver. The archive contains version 5.80.3 dated 2014-03-18 of the driver. This driver was installed by many users and received an average rating of 3.8 stars out of 53717 votes. Take a look at the list of available driver updates. Scroll the list down until you locate the Logicool Logitech HID-compliant Unifying keyboard 106 keys driver. Click on Update.